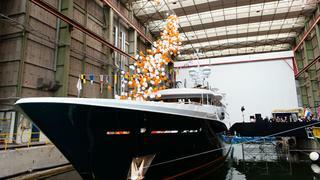 The 55m superyacht Engelberg was christened today at the Amels yard in Vlissingen, Holland. We're live on the scene to bring you the scoop. The Limited Editions concept was launched in 2005 with the intention to draw up a common hull, superstructure and engineering platform, with a flowing exterior design by Tim Heywood, but allow a high degree of customisation. Engelberg is the most customised of the Limited Editions yet. Individual touches include sliding doors port and starboard in of the wide-body upper saloon, fold-down balconies in the main saloon and owner’s suite, and an extended beach club. She also features easy-access stairs that fold out off the swim platform and a large sun deck. Engelberg’s launch follows that of 199 Event in February. Another 12 Limited Editions are currently in build and Engelberg is due for delivery at the end of the month. Look out for the full exclusive feature on Engelberg in a forthcoming issue of Boat International magazine.